Too many speculators avoid commodity option trading strategies because of the perception of difficulty. However, with a little practice, trading options on futures contracts will become second nature. In our opinion, the effort put into learning commodity option strategies is well worth the effort. Not only does option trading reduce the volatility and risk of trading in commodities, but it also increase the odds of success if employed correctly. Our goal is to provide futures market participants with the resources needed to learn to trade commodity options in a manner optimal to their risk tolerance and trading risk capital. Perhaps the most valuable lesson I've learned in my decade (plus) time as a commodity broker is that holiday markets are not to be reckoned with. Volume is light and trading desks are filled with the second, and third, string staff. As a result, the markets can make dramatic and uncharacteristic moves. An example of this that still stings, is last year's Thanksgiving day crude oil futures collapse. The market was technically closed for the holiday, but the CME decided to let futures trade for an abbreviated session on the morning of Thanksgiving day. As a result of the light volume, and an ill-timed OPEC meeting, crude oil fell roughly $7.00 in single clip. In a nutshell, this is the time of year to keep trading light. In regards to the S&P and Treasuries, the holidays have an interesting influence on trade. Nearly every year (I'm not exaggerating), we see an end of the year melt-up. It is often a very slow moving grind, but it eventually adds up to a significant move. More pertinent to the current market; the week of Thanksgiving is statistically highly bullish. In fact, the Stock Trader's Almanac suggests that it might be a good idea to look for weakness prior to Thanksgiving to enter bullish trades, and strength after the holiday to exit. In fact, in the Dow, netting the day before and after Thanksgiving day has combined for only 13 losses in 62 years. The adage buy low and sell high was originally used in reference to price, but can also be applied to the practice of trading volatility. In fact, even as a commodity option trader looking to trade market price as opposed to volatility, ignoring measures of potential explosiveness while entering or exiting a market could mean financial peril. While many commodity traders, whether beginner or pro, understand the concept of buying options during times of low volatility and selling them during times of high volatility, emotions often lead a well-planned strategy astray. Unlike traders that are looking to profit from a directional move in price, volatility traders are more interested in the pace at which the market is moving than the direction. However, I argue that it is important to chart both price and volatility in a commodity market before speculating in options. Doing so provides trades with a better understanding of the 'big picture'. In my opinion, the most efficient means of trading equity market volatility isn't through the VIX index, or any other similar measure. High levels of leverage, a lack of options on futures market, and a tendency for the index value to erode over time are major factors working against the viability of doing so. Instead, I believe that traders should look to buy or sell options on S&P 500 futures, or more specifically the e-mini S&P (symbol ES). The S&P 500 is a broad based stock index and its value is sharply impacted by market sentiment and the corresponding volatility. Thus, a trader that is of the opinion that volatility will increase may look to buy volatility through the purchase of options written on S&P 500 futures and those looking for volatility to decrease may look to sell volatility buy going short options on the index. Accordingly, insiders often refer to the practice of buying or selling options as "going long volatility" or "going short volatility". As mentioned, one way to speculate on variations in volatility is through the practice of option selling, often referred to as premium collection. It is important to realize that I am referring to trading American style options which allow traders to buy, sell or exercise options at any time prior to expiration. This differs from the European style versions that offer far less flexibility. The increased level of flexibility tends to have a positive impact on the value of the option and thus the amount of premium collected for selling it. In other words, option buyers may get more value using European style options (referred to as end-of-month options in the S&P) due to lower premiums; conversely this concept works in favor of option sellers of American style options. Option sellers are in the business of collecting premium, much like an insurance company, under the assertion that in the long run the premium collected should outweigh any potential payouts. This theory is based on the assumption that more options than not expire worthless, which has been suggested by several studies including one conducted by the Chicago Mercantile Exchange. Unfortunately, similar to insurance companies who are sometimes forced to honor their policies on excessive claims, commodity option sellers are vulnerable to monster market moves than can be potentially account threatening. Preventing such disasters ultimately come down to timing of entry along with a good understanding of futures market volatility, market sentiment, and market knowledge. Additionally, experience, instinct and, of course, luck will also come into play. Yet, in my judgment option selling is a superior strategy in the long run. Futures options selling advocates and equity market volatility traders seem to migrate to the S&P 500 futures market (e-mini S&P). There are other stock index futures such as the e-mini Dow Jones Industrial Average and the e-mini NASDAQ, but the e-mini S&P offers the most liquidity as well as a broader based index with smoother price movement. An important measure of volatility when referring to the S&P 500 is the now infamous Chicago Board Options Exchange's Volatility Index, often simply referred to as the VIX. According to the CBOE, the VIX is a "key measure of market expectations of near-term volatility as conveyed by S&P 500 stock index option prices" and has become one of the most prominent measures of market sentiment in the world. In “normal” market conditions, the VIX spends a majority of its time below 20. As chaotic price action in the financial markets heat up, the VIX can see spikes into the 30 or 40 levels. However, in historically extreme circumstances such as the 2008 financial crisis, the VIX can trade into the 70s, or even higher. The VIX futures contract is the sole futures offering on the CBOE exchange. As a result, not all futures brokers offer access to trade it. Additionally, receiving real-time VIX quotes in a futures trading platform isn’t necessarily a given. The VIX futures market offers contracts expiring each month. The margin to trade VIX futures fluctuates around $3,000 per contract and the point value is $1,000, making it a very volatile holding in any commodity trading portfolio. For instance, fi the VIX moves from 15.00 to 16.00, the trader would have made or lost $1,000 per contract with a margin deposit of just $3,000. If you’ve followed the VIX, you know that it doesn’t take much time to travel a full point. Thus, most traders are probably better suited trading e-mini S&P options, than dabbling with highly levered VIX futures. Increased values of VIX are highly correlated with higher option premium in the ES (e-mini S&P) options due to inflated expectations of future volatility built into options on futures prices. Assuming he is willing to accept the risk of participating in such a market, times of inflated expectations of volatility, and therefore over-priced options, are ideal conditions for an experienced option seller. Unlike the VIX which is derived from the underlying futures price, among other factors, implied volatility is a component of option price. The implied volatility of a futures option, is the amount of volatility implied by the market value, or price, of the option. In other words, the implied volatility is forward looking in that it incorporates the current market precariousness as well as what market participants are expecting at some point in the future. You may also find that market emotion and sentiment are a component of futures option implied volatility. As long commodity option traders scramble to “buy” volatility through the purchase of options in an attempt to profit from the latest hype, option premiums can and do explode exponentially. 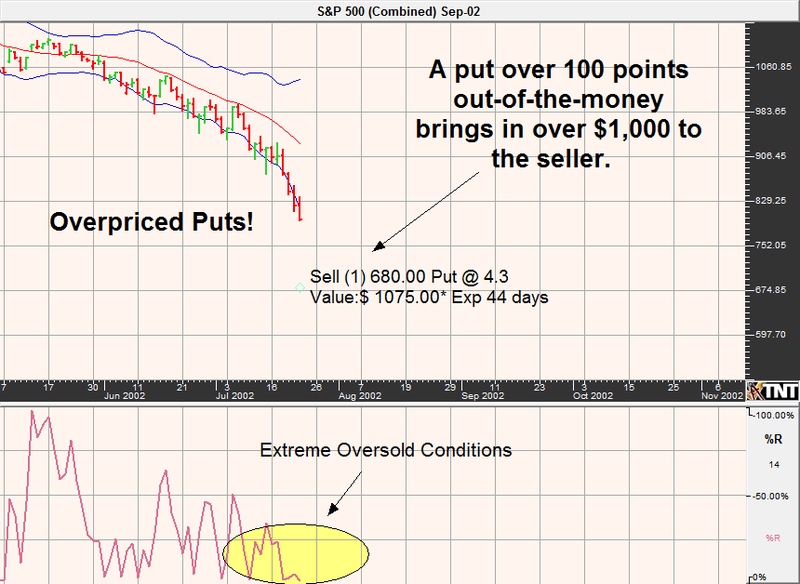 As a sidelined options on futures seller, these types of conditions should be inviting. The premise of this approach is to attempt to sell options to buyers that are simply "late to the party". The key is making sure that as a seller you aren't too early. It is often the case that selling puts is more lucrative than calls, but the added reward carries baggage in the form of additional risk. Due to the increased levels of risk, timing becomes crucial. By nature an option selling program in the futures markets tend to leave room for error in the execution. Nonetheless, being short puts in a spiraling market can quickly change that. The phenomenon of put premium in the stock indices being larger than call premium is often referred to as the volatility smile. The volatility smile is a long observed pattern in which at-the-money options have lower implied volatility than out-of-the-money options along with the idea that there is more value in owning a put relative to an equally distant call. This scenario seemed to be born after the crash of 1987 in the U.S. While there are no crystal balls to let us know when a futures market will turn around and how low that it might go before it does, being aware of historical patterns in price, volatility and market sentiment may help to avoid a compromising situation. Let's take a look at the relationship between the VIX and the S&P. Looking at the chart below, it is obvious that the S&P 500 has been able to forge recoveries during times of spiked volatility as measured by the VIX. Armed with this knowledge, it may be a viable strategy to look at erratic, and many times irrational, trade as a point of entry for put sellers. For example, based on this assumption put sellers may have fared well during the lows in 2001, 2003 and 2007, and 2011. That is of course assuming that the option seller wasn't early in his entry. If a short volatility trader enters a market prematurely, there is a strong possibility that the trader will be forced out of the market prematurely due to lack of financing or margin. Let's take a look at one of the most opportune times in history to be a volatility seller (sell puts in the S&P). Beginning in the middle of 2002 and throughout the beginning of 2003, put sellers with savvy timing may have done very well. However, trading is a game of risk and those selling puts during those times were accepting great amounts of risk in order to reap the reward. Let's take a look at a continuous S&P 500 futures chart during the 2002/2003 lows. While the VIX is a great indication of volatility and extreme market sentiment, it is also helpful to look at indicators of volatility such as standard deviations. Luckily, the creation of Bollinger Bands allows us to visually determine market volatility through the line plot of two standard deviations from its mean. 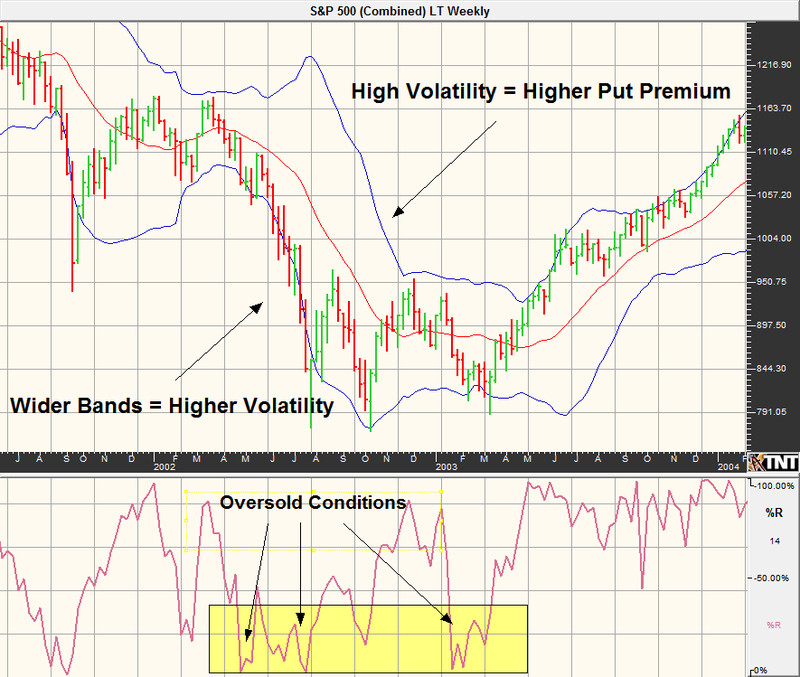 Times of high volatility are denoted by wider bands, or a larger standard deviation, and times of decreasing volatility result in narrowing bands. 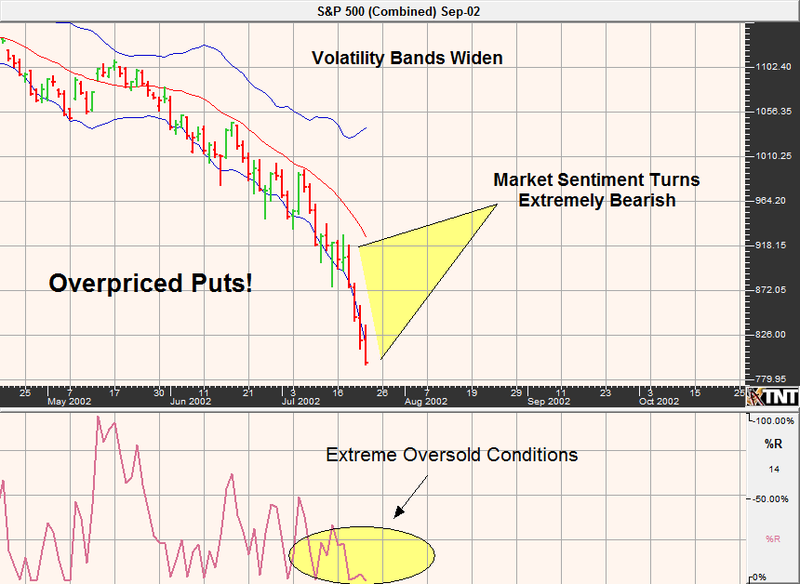 As futures market volatility increases, so will option prices. During such times, commodity option buyers are forced to pay extremely high prices for options that in theory are more likely to expire worthless than not. On the other hand, option sellers are provided top dollar for accepting theoretically unlimited risk. As you can see, the more money that the option seller collects, the deeper-in-the-money the option can be at expiration without resulting in a loss to the trader. According to the hypothetical data available to us, in July of 2002 with the September futures e-mini S&P price near 780, it may have been possible to sell the August S&P 500 futures 680 put for $4.3 in premium which is equivalent to $215 before commissions and fees (each point in the e-mini S&P is worth $50). If this was the case, a trader could have collected a little over $200 U.S. dollars for an option that was, at the time, approximately 100 points or nearly 13% out-of-the-money. $215 per contract before transaction costs might not sound like a lot of money, but considering the margin on the trade (required deposit in a trading account) was under $1,000 most traders could have sold them in reasonable multiples. For instance, selling 5 of the August 680 puts might have brought in a little over $1,000 in premium for a margin requirement of less than $5,000. Those that like to calculate return on margin, it would have been roughly 20% had the option seller held the short futures options to expiration a mere four weeks down the road. *This chart assumes selling a single option in the full-sized S&P futures, which is equivalent to 5 e-mini S&P options. We recommend using the e-mini version of the options due to liquidity and option market transparency benefits. At expiration, this trade would yield the maximum profit of $1,075 before commissions and fees if the futures price is above 680. Ignoring transaction costs the reverse break even on the trade is at 675.70. This simply means that this particular trade makes money with the e-mini S&P futures price trade anywhere above 675.70 before commissions and fees. Please note that the amount of commission paid will reduce the premium collected and shift the RBE closer to the market. To look at it in another perspective, the trader can be wrong by 104.3 points after entering the trade still manage to break even. If the trader's goal is to put the odds in their favor, this seems to be a commodity option trading strategy to consider. Without regard to transaction costs, futures and options trading is a zero sum game; for every winner there will be a loser. Thus, putting your odds ahead of those of your competition is a must. In my opinion, selling options during times of high volatility, while exercising patience, and incorporating experience, is doing just that. With that said, where there is reward there is risk; in efficient markets you cannot have one without the other. A short option strategy in the futures markets should only be attempted by those that have ample risk capital to allow for potential drawdowns as well as the ability to manage fear and greed. Fearful traders are vulnerable to panic liquidation at inopportune times in terms of market volatility and option pricing. Likewise, greedy traders are tempted to sell options closer-to-the-money in hopes of higher payouts but the risk may turn out to be unmanageable. I strongly believe that less is actually more when it comes to premium collection. Trade less, collect less, and hopefully enjoy more success. There have been many books written on options on futures trading, however I sometimes question the usefulness of the information provided. It seems as though much of the literature available leaves the reader in a state of confusion; perhaps a majority of the bewilderment stems from the fact that most option theory is based on stock option trading and the transition to commodities isn't without its hitches. In my opinion, the practice of repackaging stock option trading strategy and theory in an attempt to appeal to and educate commodity traders can be misleading. Additionally, there are large differences between option theory and option trading. Some of what looks good on paper is difficult to execute efficiently in the real world, this is especially true in the world of commodity option trading. It is a false assumption to believe that an “option is an option”. They may be spelled the same, but they are vastly different due to the nature of the underlying vehicles. As a result options on commodities take on completely different characteristics. After all, everybody agrees that trading stocks is poles apart from trading futures. Why would anybody believe that trading options on stocks is synonymous with trading options on futures? There are advantages and disadvantages to every commodity trading strategy, but in my opinion, option selling delivers the best overall odds of trading success. The favorable probabilities are due to the simple fact that options are priced to lose, and time is on the side of the option seller. To illustrate, an option buyer must see the market move in the desired direction, in a minimum magnitude, in a finite time frame, in order to see a profit. Option sellers, however, have far more room for error and can even make money when moderately wrong in regard to futures market direction. With that said, there is no such thing as "easy money" in the commodity markets. Successful commodity option premium collection requires proper risk management, keen instinct, patience and even a little bit of luck. *There is unlimited risk in commodity option selling! The premise of commodity option selling is to collect premium through the sale of options on futures in hopes that the time erosion and volatility decay of a particular short option will overcome any increase in option value due to adverse price movement in the underlying futures market. An option selling strategy offers unlimited risk and limited reward, which is opposite of what many might consider rational. Nonetheless, the odds of success on any given short option trade are arguably in favor of the seller over the buyer. The concept of an option is nearly identical to that of an insurance policy. The buyer purchased the instrument to receive a payout should a substantial event occur. The seller of the instrument, is collecting a payment in hopes of the “policy” expiring worthless. Accordingly, the practice of commodity option selling is similar to the business of selling insurance policies. Most of the time, premium is collected by the insurance company and kept as a profit, but there will be times in which unexpected circumstances arise and trigger "claims" against the policy, or in the case of option trading a large drawdown at the hands of an increasing option value. In other words, like that of insurance policies, the odds of success on each individual option selling venture is high, but the challenge is to keep the magnitude of the losing option selling positions to a level in which it is possible to be profitable in the long run. Call option “writers” receive income (option premium) in return for the liability of honoring the option buyer’s right to buy the futures contract at the strike price. A short call is an eroding asset to the buyer and an eroding liability to the seller. The buyer has the right, but not the obligation to take delivery of the underlying futures contract at the stated strike price but the seller is obligated to accept the assignment of a short futures contract at the strike if the option is exercised. The seller's risk of being forced to honor the buyer’s rights diminishes with time; all else being equal the value of the option will erode. In a nutshell, the seller of a call option keeps the premium collect if the trade is held to expiration and the futures price at that time is below the strike price of the call option. Put “writers” receive income (option premium) in return for the liability of honoring the option buyer’s right to sell the futures contract at the strike price. If exercised, the option buyer has opted to exercise the right to go short a futures contract at the strike price and the put seller is obligated to buy the futures at the same price. Identical to a short call, a short put is an eroding asset to the buyer and an eroding liability to the seller. Also, the seller's risk of being forced to honor the buyer's rights diminishes with time and volatility. To summarize, if held to expiration, the seller of a put option keeps the entire premium collected if the futures market is trading above the strike price of the put. We’ll go over an example of a short put to give you a clearer picture of how a short option trade works. Some option sellers practice what is known as a delta neutral strategy in which both call options and put options are sold simultaneously to create a trade without any directional bias. In its simplest form, a short commodity option strangle seller sells a call for every put sold; generally the strike prices are equidistant to the current futures price. The advantage of selling an options strangle in the futures market, as opposed to selling only one side of the trade (a call or a put), is increased profit potential and more room for error. Obviously, by selling both a call and a put, the trader has automatically doubled the potential gain on the trade. Further, the sale of both calls and puts along with the additional premium collected, provides a bigger buffer to cushion losses should the futures price trade beyond the strike price of either commodity option. Accordingly, many believe this to be a lower risk strategy relative to selling calls or puts outright on a directional basis. In the example portrayed in the displayed chart, it might have been possible to sell a September $62 crude oil put for 53 cents, or $530, at a time in which crude oil was valued near $80. The same option was worth only 17 cents ($170) just two days earlier prior to a multi-day plunge. Options that have tripled in value, as such, often have a tendency to see sharp premium erosion should the futures market stabilize. Accordingly, these types of spikes in option premium are attractive to option sellers. On the contrary, those that were already the 62 put prior to the two-day sell-off would be an unpleasant situation. This just goes to show you how important timing and volatility can be, even in a so-called passive strategy such as option selling. Simply put, making money by selling commodity options isn’t as easy as selling calls or puts and hoping for the best. Traders must be patient in order to be in a position to capitalize on an increase in volatility, as opposed to getting run over by it. The maximum profit of this particular short option trading example, is $530 minus transaction cost. The max payout occurs if the option is held to expiration and the futures price is above the strike price of $64. However, even if the price is a little below $64, all is not lost; this short option position pays off at expiration with the price of crude anywhere above $63.47. This is because the premium collected of 53 cents, or $530, acts as a buffer to the risk of being assigned a futures contract at the strike price of $64. Should the price of crude be trading below $64 at expiration, the risk is similar to that of being long a futures contract. The option value will fluctuate quickly and the trade faces theoretically unlimited risk. As you can see from the chart , it is possible for this trader to be profitable whether the market goes up, down, or sideways; the only risk is in a massive price collapse (in this case below $64). If the price of crude is above $64 at expiration ($64 to infinity), the max payout is received by the option seller. In other words, the profit zone is large and likely, while the loss zone is far less likely to be seen. Similar to buying a car and watching its value drop as you drive it off the lot, (all else being equal) options on futures lose value with every minute that passes. This is because as time passes, the odds of an extreme event diminish. Assuming the futures price doesn’t increase in volatility, and more importantly do so in an adverse direction of the short option, time is money to an option seller. On the other hand, option buyers often suffer slow and painful losses in the absence of a dramatic price change. In fact, some studies have suggested that somewhere between 70% to 90% of all futures options expire worthless. Because of these characteristics, option selling is the only strategy in which a trader can be wrong and still make money! For example, a trader going short a call option is accepting the risk of the futures price going above the strike price of the short call. However, the futures price can go up, down, or sideways and still produce a profit to the option seller as long as the futures price doesn’t exceed the strike price of the commodity option. The most common turn-offs to options on futures selling are fears of margin calls, stories of account threatening losses but the truth is trading of any futures or options strategy involves substantial risk. At least commodity option sellers are putting the odds in their favor. On the contrary, option buyers are in essence purchasing lottery tickets in which their risk is limited, but the odds of success are unattractive. In other words, although option buyers face limited price risk, they are more likely to incur a high percentage of losing trades. Selling options can be a high probability trading strategy, but it doesn't come without stress and risk. Although option sellers are betting against extreme price moves, it is critical that traders attempt to time their entry in regard to market analysis, sentiment and, most importantly volatility. Failure to do this will increase the odds of panicked premature liquidation, large draw-downs, or worse. Be selective and remember, it is better to miss a trade than to impatiently enter a market only to suffer the consequences of exploding market volatility, and therefore option values. Another wave of stock selling in China failed to excite the U.S. equity market bears. In our opinion, the bears are simply busy doing other things (not trading). In regard to both volume and volatility, this is one of the most sluggish markets we've ever seen during our time as commodity brokers. It feels like Christmas in August! (If you've ever followed the markets over the holidays, you know what I'm talking about). We've been reminding our readers of the fact that China is a communist country with few rules. When things get bad, they simply fabricate stability through money printing, legal restrictions on stock selling, currency market manipulation, implementing constructions projects with no real purpose, etc. Last night the Chinese central bank reached into their bag of tricks, and pulled out one of the largest cash injections into their financial system in nearly 2 years to put the brakes on economic contraction. Despite the government's intention of stability, the reaction was panic. The First 1% down day in the S&P 500 since October 11th. Finally, we are seeing the equity market correct. Traders have been waiting months for this, but I doubt it was everything they had hoped for. Although it is a relatively decent one-day sell-off, today's action was meaningless in comparison to the post-election night rally. Further, selling was orderly and without panic. The good news is, the market is looking healthier. Corrective trade is "normal" and should be expected. As crazy as it sounds, the market needs to be bearish before traders can get comfortably bullish and buying picks up. Today's shake-up is being blamed on yesterday's Congressional hearings and today's uncertainty regarding Thursday's health care vote in the House. The Republicans claim they have the 216 votes necessary to pass the bill, but some last minute amendments are raising concerns. As we've been stating in this newsletter, the markets had priced in political perfection but governments are designed for flawed operations (checks and balances). The financial markets could get rocky as the new administration attempts to administer change. Trade tariff talk is just that, we've yet to get anything concrete. Yet, the market is emotional. This is nothing new, if there is anything we've learned from the first year (+) of the Trump presidency it is the conversation always starts with drama, but then settles down to something more reasonable. Unfortunately, the markets haven't quite figured that out yet. Those that believe markets are efficient, will have a hard time explaining what we've seen in the previous three or four trading sessions. Tariff discussions, without any concrete decisions, can't explain such big swings in asset prices. The only rational explanation for this type of volatility is (ironically) irrationality. Markets are emotional, and we are being reminded of that. The low volatility slumber of 2016 and 2017 were anomalies and are probably behind us. The "buy and holders" might not be happy with the market environment before us, but the reality is the expanded volatility will eventually provide opportunities for traders (particularly option sellers). Further, it might not feel like it but this is a healthier market than what we saw in late 2017 and January 2018. The ES bears have a slight edge, but they need to move fast. The S&P has gone into correction mode but the selling has been tepid. The complacent bulls haven't been given a reason to second-guess their bets; if the bears want to make progress they will want to see something happen sooner rather than later. The longer prices hover in this area the more likely the edge will shift back to the bulls. The meaningful economic reports and the bulk of corporate earnings are behind us. From here, the market will have to find a way to stand on its own two feet. In our opinion, the legs of the bull are a little shakey. Assuming we don't receive any surprise tweets or trade tariff resolutions, the ES should creep into the 2780ish area and Treasuries should begin to make their way higher. China is playing Trump's game...start the discussion with a bazooka before eventually pulling out the bb gun to negotiate. US equity and commodity markets were reeling last night on news of new Chinese tariffs. Not surprisingly, the markets overreacted. China's tariff threats don't go into effect immediately, and there is plenty of time for negotiations to take place. Further, it is important to remember that China imports much more to the US than the US does to China. Thus, an immediate fifty handle collapse in the ES on the news probably wasn't justified. As the day wore on, traders began to realize this and put their money where their mouths were by buying into the dip. We saw similar action in the commodity markets, namely soybeans and the meats. We had previously recommended bullish trades in corn, soybean meal, cattle and hogs that caused some stress during today's session but appear to be on the right track. In any case, there is no logical reason to see a market such as live cattle go from being nearly limit down to limit up within the span of hours. There is no room for complacency, nor panic, in these markets. The goal should be to stay hedged and grounded.